The Andover Rotary's Andover Cares movement introduced the potential of Rotary to new people who want to make a difference in their community. However, for many, the traditional service club model of required weekly meetings and just doesn't fit into the busy lives we all live today. 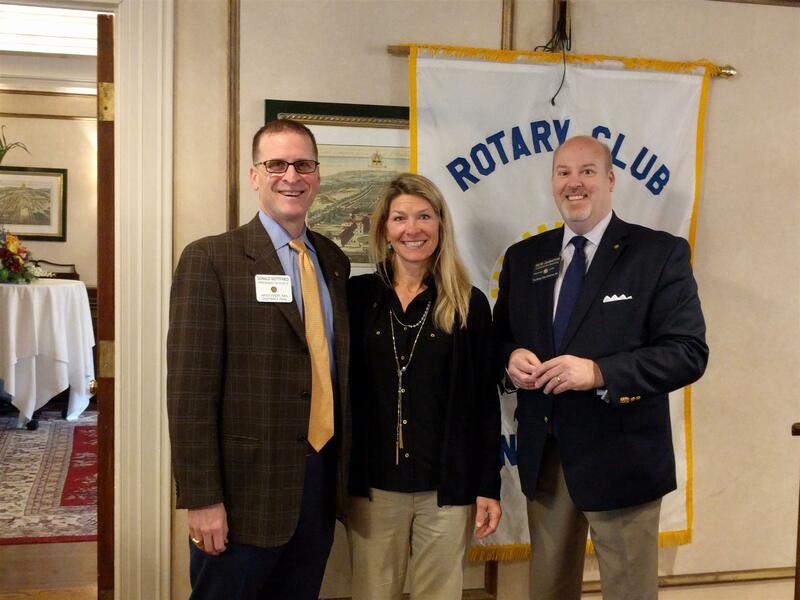 So Andover Rotary created two new membership levels. A Service Membership has fewer meeting requirements, lower membership fees, and evening meeting options. An Corporate Membership is very similar to our traditional membership option. The principal corporate member gets all of the benefits that are included with a traditional membership, along with the flexibility to send a designee/associate to meetings that he/she is unable to attend each month. Corporate members may also bring associates to help at Rotary service projects. We encourage all of our principal corporate members to attend at least 1 meeting per month. Want to learn more about joining the Rotary Club of Andover? Please feel free to contact Membership Chair Maureen Burns-Murtha with any questions about these great options for busy local business leaders ready to join a great service club helping to improve our community. Ready to apply for membership? Download an application here. Rotary is one of the most prestigious service organizations in the world. Rotary International consists of 1.2 million members in 34,000 clubs worldwide. Members are leaders in business, the professions and the community. Rotary’s motto of “service above self” is channeled through the numerous avenues of service: club service, vocational service, community service, and international service. Join us as a guest in a meeting or two! Rotary membership has numerous privileges. Regardless of your membership level, you’re a “full” Rotarian, with all rights and benefits. You can attend make-up meetings at any of the Rotary clubs around the world, and attend Rotary and Rotary Leadership Institute programs too. TRADITIONAL MEMBERSHIP: The traditional membership includes meals at all weekly meetings, full dues paid to our District 7930 (and Rotary International), $100/year contribution to the Rotary Foundation. Invoices for TRADITIONAL membership dues (including contributions to Rotary International and District) are sent quarterly by our club treasurer. .
CORPORATE MEMBERSHIP: Similar to traditional membership, this includes one meal at each weekly meeting, plus all other benefits of a Traditional membership for the principal corporate member. The principal corporate member from the company should attend at least 1 meeting/month, and he/she may send a designee to each other weekly meeting. Invoices for CORPORATE membership dues are sent quarterly by our club treasurer. SERVICE MEMBERSHIP: The service membership option was introduced to the Rotary Club of Andover in 2015. It’s designed for people interested to help with our service projects, but unable to attend weekly meetings. Service members have all rights and privileges of full membership, but typically attend one meeting/month (usually an evening club meeting, typically held once per month). Service members may attend additional meetings, paying for the meals at each of those additional meetings. Invoices for SERVICE membership dues are sent quarterly by our club treasurer. Our board and club members will review your membership as quickly as possible. In the interim, we welcome prospective members to attend club meetings, meet members, and volunteer on our numerous service projects. Attend as many meetings as possible, meet new people, and get engaged! There are numerous committees where you can help, along with opportunities to help our service projects and initiatives in the community. Attending meetings is a great way to share fellowship and fun with the members of the Rotary Club of Andover. We meet most weeks on Fridays at 7:30 am at the LANAM club in Andover, and also hold one evening meeting each month, on the 3rd Wednesday of the month.